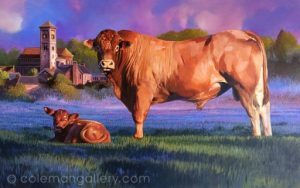 The Limousin Bull painting is coming along nicely and hopefully in the next month or so it’ll be finally finished. The rather Italian looking church is actually Hoarwithy Church in Hoarthwithy, Herefordshire, UK. Newer Post Symonds Yat in progress. Older Post ‘Old Boy’ Spaniel by Ian Coleman. Oil on canvas.